I have an ancestor who died rather young (late forties) at a time when there was no major military conflict. This was post-1900 as well so life expectancy wouldn't excuse this as a natural death. He died in England in 1958 according to a death registration which contains only the district, year of birth and year of death but no one in my family ever met him so we can't contact any immediate family as of right now. Are there any documents recording cause of death that would be publicly available from this time period? Death certificate: As per Adrian's answer, the death certificate is the obvious place to find the answer. 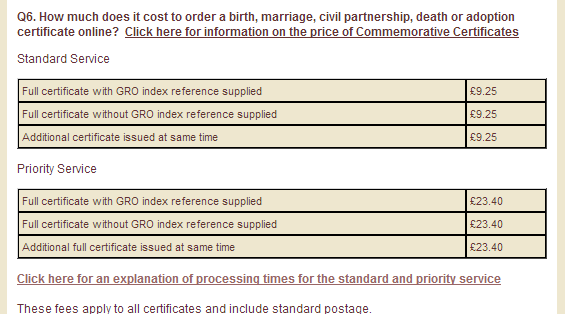 The cheapest way to obtain a certificated copy of an entry of death from England and Wales is from the GRO. The statutory fee for a death certificate is currently £9.25. Contacting the local district where the original registers are held is also another means of obtaining the certificate, but the fees are either the same or higher than the GRO. Current legislation prevents researchers from accessing the information contained in death registers by any means other than certificates. Newspapers: Searching newspapers on, for example, the British Newspaper Archive, may reveal some information if your ancestor had a strange, sudden, or remarkable death. Libraries in the locality of the death are more likely to hold newspapers that pertain to the place and period of interest. It could be a painstaking, possibly fruitless exercise to search for a newspaper not even knowing the date or place of death. Coroner records: Rarely (and I can't emphasize rarely enough) coroner's reports may survive for deaths that had an inquest, which can be a treasure trove of information. These reports are usually archived locally, see the local records office for more information. I would not recommend searching these before obtaining the death certificate, which will state if a post mortem took place. Medical or institional records: If your ancestor died in a hospital or institution, records may survive pertaining to that institution. Medical records will no doubt be closed to the public for 100 years, however you may be able to obtain access to a particular ancestor's records by seeking permission from the relevant Health Authority. My approach with cause of death is to start with the death certificate, and if it looks like there might be some more interesting information pertaining to the death, then start to see what other avenues of research might be taken. The death certificate itself, surely. I am assuming that what you have seen is only an index to the death certificates, as I have never seen death certificates without cause of death. We can't be more specific without knowing which administration issued the certificate. The link below is to an index to the General Registrar Office certificates for England and Wales. FindMyPast carries indexes only to those certificates. Ditto Ancestry by the way. To get anything other than the fairly trivial data in the index, you need to send for the certificate itself from the GRO. Use link to GRO site. That carries cause of death. I recommend that you read some basic books or articles about family history otherwise you'll be wasting your own time. As already stated in previous answers, the obvious course of action is to use the reference in the registration you've already found and order the certificate from the GRO's Certificate Ordering Service. They provide a Guide to Death Certificates which includes an example of a pre-1969 death certificate. Click through to their site to see their explanation of delivery times and to find other information about getting started with family history. An indirect method to get more information -- to determine if the GRO reference you've found might be the person you're looking for -- is to do a probate search to see what information might be in the probate calendar. This will not show a cause of death, but may give you a date and place of death, a residence, and other identifying details. I picked an entry at random from 1958 as an example. Other entries on the same page listed the hospital at which the person died. The will or administration won't give the cause of death, but if you decide you want whatever information might be in the probate papers, you can order the will online. What "hidden" clues are there in the GRO Indexes of births and deaths? Not the answer you're looking for? Browse other questions tagged england death-records cause-of-death 1950s or ask your own question.